But despite its structural density, it is rather Costa’s process that seems the main obstacle to any easy understanding of the film. As always with Costa, his seemingly guileless, unapologetic slippage between documentary and narrative modes presents problems for critics and spectators alike. This elision of registers is compounded by Horse Money's first images: photographs by Jacob Riis from his 1890 book How the Other Half Lives, which documents the tenement dwellers of 1880s New York City. Riis’s images function both as raw historical fragments and vivid dreamscapes—records of the past and entryways for the imagination. In Costa’s film, they’re accompanied by dead silence: blurred faces, low-ceilinged rooms, a goat, a corpse, winding alleys with washing lines, small makeshift groups of people staring idly, maybe aggressively back at the camera. In Riis’s images, as in Costa’s, there is a unresolved, anxious quality, a suggestion that the relationship between those in front of and behind the camera is either one of social and political solidarity—even, ideally, collaboration—or of exploitation, aestheticization, a kind of poverty tourism. The disagreement between Sperling and Fairfax turns upon a set of questions familiar to discussions of the politics of representation in cinema and in Costa’s body of work in particular: questions concerning the proper means of depicting the experiences of poverty, subalterity, and trauma, and indeed the question of who the film is by, about, and for. Who is Ventura, exactly? Who is he for Costa and for us? Are we to see him as an actor or a subject, a collaborator or raw material for Costa’s cinema? Surfaces and pathways: perhaps the answer lies in Costa’s notion of space—a new space, and the doors one must open in order to access it. This is, after all, the question that has preoccupied all of Costa’s Fontainhas films: how to create a new space when one’s home, one’s neighborhood, is being demolished? Fontainhas was literally crumbling as he made 2000’s In Vanda’s Room. In 2006’s Colossal Youth, the neighborhood’s inhabitants drift between the last remnants of the neighborhood and its surreal counter-image: the hard-edged, sunbaked surfaces of the state-sponsored apartment block to which they have been forcibly relocated. Is it possible for cinema to offer an imaginary, temporary space for a population in transit, on the verge of dissolution and compartmentalization? The further Costa’s films wander from Vanda’s rooms, the more they become caught in transitional spaces, in alleys and passageways. Most of In Vanda’s Room and Colossal Youth take place in full sun, refracted through corridors and cracks in the walls; Horse Money is a night film, a nocturne in black and gold. The features of Costa’s mysterious, heterotopic Lisbon have now been completely evacuated, emptied out, so that the image itself is often mostly black negative space, as if the architecture itself has been erased, the image scratched out. Even the now-trademark texture of Costa’s video resolution is different, its busy pixel-grain calmed and flattened into deep, fathomless pools. This is a new approach for Costa, and quite a shocking one. It’s still unmistakably Costa’s work: in the exquisite precision of its camera and lighting placement, its uncomfortably close sound design, and in its use of consumer-grade digital video. But here each of these is heightened and distinct from his previous work: the framing is not simply uncanny but almost spatially impossible; the soundtrack is often dead silent, at other times so hushed that you can hear Ventura’s hands shaking. Here, the familiar locations of Costa’s films become something still more alien—a kind of purgatory, or oblivion. When the montage of Riis photographs ends and the film’s action begins, Ventura descends, half-naked, into shadow, through a nightmarish underworld of networked corridors that seem to lead nowhere. 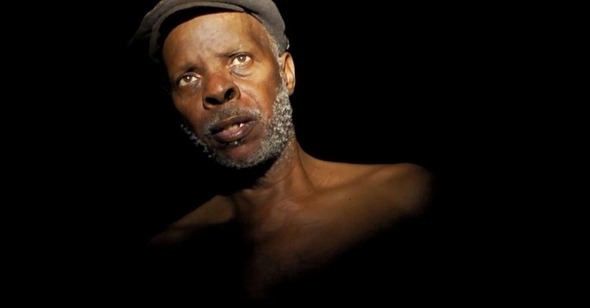 “Hospitals, prisons, rooms, it’s all the same, it’s always underground,” Costa said in an interview with Cinema Scope. “It’s not one—it’s millions of hospitals and corridors and doors, so there’s no match. It’s a film where nothing matches. The doors are always different, but they are always hospitals, prisons, with the same sound, the same heaviness.” In Horse Money, the messy, sprawling demimonde of Fontainhas has been definitively replaced by a set of interchangeable and unforgiving institutions—shadows of a necropolitical architecture that fully dominates and configures Ventura’s subconscious. Soldiers and doctors prowl these passageways, leading him, limp and glassy-eyed, deeper underground. When Ventura descends these dark passages and corridors at the film’s outset—descending toward the camera, out of the darkness and very slowly into focus—he strikes a gaunt, inhuman figure that looks like no one so much as Nosferatu, clad in a worker’s cap and red undies, hollow-eyed with his long fingers continually moving in little neurological spasms. In fact, if Horse Money is at all classifiable, it’s as a horror film. Critics often grasp for cinematic points of reference to situate themselves in Costa’s work. At Q&As with the director, a question will inevitably be asked about connections between his films and those of John Ford, which Costa, although an evident cinephile, will then dismiss as crazy. Nevertheless, In Vanda's Room, with its excessively detailed mise-en-scène, is haunted by the ghost of melodrama; and for all its chilling sequences, Colossal Youth is a comedy of deadpan longueurs, a ground-level Mon oncle hiding inside deep, mazelike interiors. Horse Money recalls the cinema of F. W. Murnau, and not just because of its main character’s vampiric movements. Costa’s expressionistic framing and geometries seem to warp the rigid 4:3 aspect ratio of the silent cinema, which here seems almost vertical, always catching more of the ceiling or floor than would seem possible for such a composition. But Costa’s film also makes it clear that these nightmares are intractable, inscribed into Ventura’s very body, which is visibly wracked by nervous disease. (“I know my sickness,” he tells one faceless doctor.) Even if the images are often obscure, inscrutable, they have a physical heft. Here, objects take on an almost fetishistic intensity: a pen, a telephone, a passport, a spoon, a knife. And the ghosts and demons that wander these spaces have a weight of their own. In Costa’s short film The Rabbit Hunters, Ventura lamented, “My hands shake and I drop the snuff. A lot of departed spirits walk with me.” In Horse Money, there are not just doctors and soldiers, but Ventura’s half-recognized friends and relatives: friends he used to work with, now fellow prisoners who have also been damaged; his nephew Benvindo, who has been sitting in an office waiting room for twenty years, waiting for his salary; Joaquim, in a blood-red, ruffled shirt, who whispers to him that he must “Confess.” Most important among these is Vitalina, whose role in this world is unclear. Leather-jacketed and rolling a suitcase through black city courtyards, she speaks to Ventura in a gravelly whisper. Is she a doctor? Priestess? Or simply another wanderer and a widow, another lost soul? With his Fontainhas trilogy, Costa said that he began and ended each project with the people in them, developing and adapting their contributions into the film, which he would finally screen for those people in their neighborhood. This notion of the neighborhood implies a physical proximity in the process or with the potentiality of becoming a community. Horse Money implies a darker, more transitional space. As in Riis’s photographs, figures hover in the frame, themselves transitional. Costa seems to restage Riis’s images for Horse Money’s central section, with his own cast of collaborators sitting in their abodes. The sequence takes on the form, curiously, of a little music video: as a song by the Cape Verdean group Os Tubarões, with its lyrics that speak of dry roots struggling to reach deep buried water, land ownership, migration, return, we see each figure captured in still tableaux, sitting in his or her bedroom or kitchen. In the last of these, right in the center of the frame, a doorway opens almost imperceptibly—a crack, an escape hatch leading somewhere beyond the confines of the film.